The concept of damage tolerance assessment was introduced in an attempt to allow each individual component in an engineering structure to be used to the limit of its ability. Depending on the materials used in manufacture, many engineering components can tolerate the presence of defects provided they do not exceed some critical size. The critical size is the point at which the defect becomes unstable and very rapid crack growth to final failure may be expected. For cracks, this point is defined by the stress intensity at the crack tip (K). When the crack tip stress intensity reaches the fracture toughness of the material (Kc) then the crack will run to failure at a catastrophic speed and the part will fail completely. For values of (K) much lower that (Kc) relatively slow and stable crack growth may be expected and the part may be expected to operate relatively safely. Damage tolerance allows each individual part to be operated until a crack is detected by the best available inspection method. 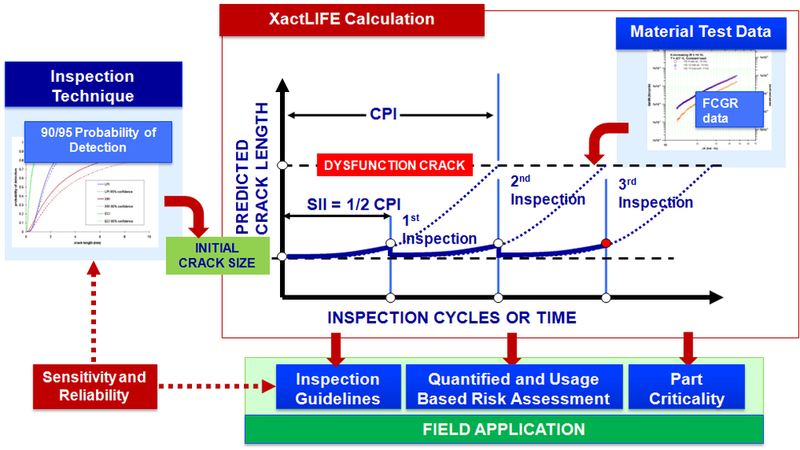 If a crack is not detected then the part is returned to service assuming a crack have been missed and if a crack is detected then it should be replaced. More information on Damage Tolerance Assessment services can be found here.